An investigation is under way after three teenagers died following an apparent crush as people tried to get into a St Patrick's Day disco in Co Tyrone. The incident happened at the Greenvale Hotel in Cookstown. 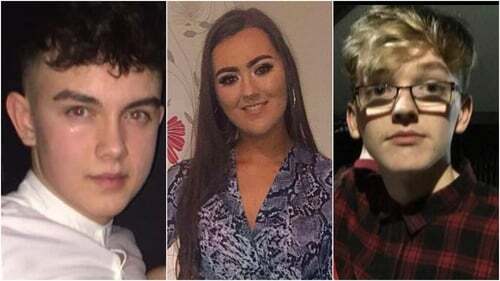 The PSNI has named the three young people who died as Lauren Bullock, 17, Connor Currie, 16, and 17-year-old Morgan Barnard. Lauren, who was from the Donaghmore area, died at the scene. Connor and Morgan, who were both from the Dungannon area, died later in hospital. While the exact cause of the deaths is still being investigated, police believe the teenagers were crushed when hundreds of young people tried to enter the hotel. It is understood the doors were closed at the time. Police have said that a Major Investigation Team has been assigned to investigate the deaths. Assistant Chief Constable Alan Todd said: "A major investigation is under way and I can confirm that a specialist team of detectives has now been assigned to the inquiry. "They will seek to establish the full circumstances of this dreadful incident. This will be an extensive investigation with potentially hundreds of witnesses, many of whom are teenagers." He appealed for any young people who were at Greenvale to contact detectives to assist them in their investigation. Detectives are examining CCTV footage of the incident which happened at about 9.30pm last night. President Michael D Higgins has offered his condolences to the families and friends of the three teenagers who died. In a statement he said: "As President of Ireland may I express what I know is the shared grief of the people of Ireland at the terrible loss of life of young students in the tragedy that took place in Cookstown, County Tyrone on St Patrick's Day. "May I offer, in particular, my condolences to the families of the victims and to the pupils of the schools in Dungannon that I visited recently." The schools the teenagers attended held a joint prayer service today. Connor and Morgan were pupils at St Patrick's Academy in Dungannon. Lauren went to the school next door, St Patrick's College. A tribute was also paid by Edendork GAA Club, where Connor played. In a post on Facebook, the club said it was "deeply saddened and devastated to hear of the tragic passing of our much loved and highly thought of player and member Connor Currie. Euphoria All Star Cheerleading Group also led tributes to Lauren, who performed with the group. The group said it is "absolutely devastated", adding that Lauren was "the most down to earth, beautiful soul". It said she was "an incredible cheerleader" and was the backbone of the team. Primate of All Ireland Archbishop Eamon Martin also paid tribute to the three teenagers who died. "Our heartfelt thoughts and prayers are with the families and friends of Lauren, Connor and Morgan, and with all of those who were caught up in the horror and distress of what happened, including those injured and traumatised, and the emergency services and staff who responded," he said. A Book of Condolence was opened at St Patrick’s Church in Dungannon, for parishioners to express their sorrow and support for the families. Democratic Unionist Party leader Arlene Foster tweeted that her "thoughts and prayers" were "with everyone impacted by this tonight". "My thoughts and prayers are with the families," she added. Northern Ireland Secretary Karen Bradley said: "I am deeply sorry to hear that three young people tragically lost their lives at a hotel in Cookstown. They were joining others in what should have been an evening for celebration. "My thoughts and prayers are with their families and friends at this extremely difficult time. "I have spoken this morning to ACC Mark Hamilton, of the PSNI, who is leading the investigation alongside the Health and Safety Executive, and I asked to be kept updated. "I want to thank the police, ambulance and fire services for all that they did last night in responding to this incident."